I love looking out my window and seeing the wisteria climbing up onto the cottage porch. Wisteria is one of my favorite vines. I planted it here at Ravenscourt when I built a new garage with a guest cottage on top. 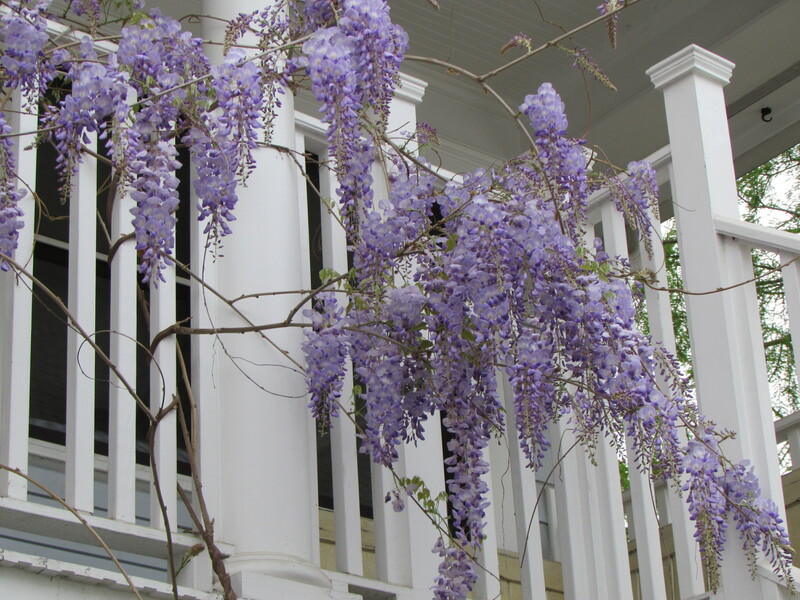 The wisteria grows up the stairs to the little porch on one side and across the small pergola above the garage door on the alley side. It is a wonderful bloomer and is maturing nicely. We have had to cut it back to paint the stairs and when it got too heavy for the pergola. Here you can see the trunk is nicely contained in the corner of the driveway. 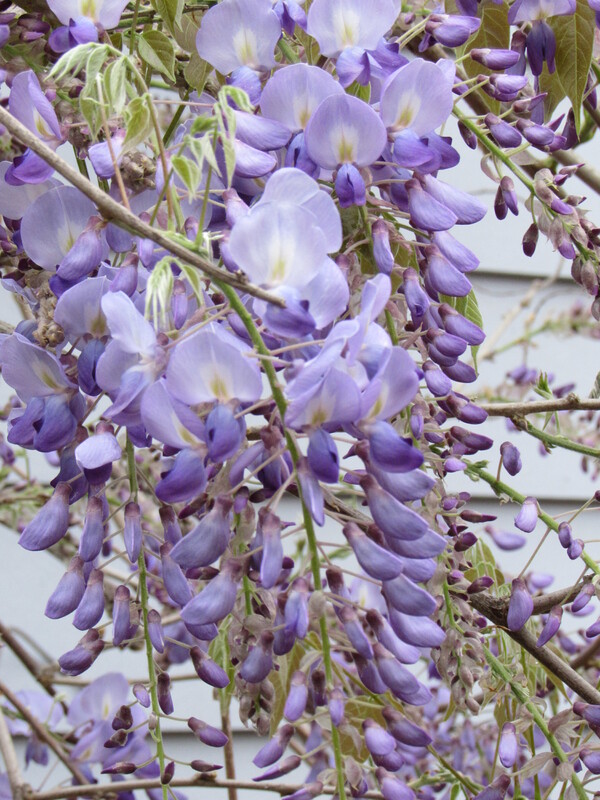 Wisterias are fast growing, hardy vines that twin and twist as they climb. They can be invasive and you need to be careful to plant it where you can keep it contained and under control. Each spring before the leaves appear they begin to flower with wonderful clusters of pendulous blooms that remind me of grapes hanging on a vine. 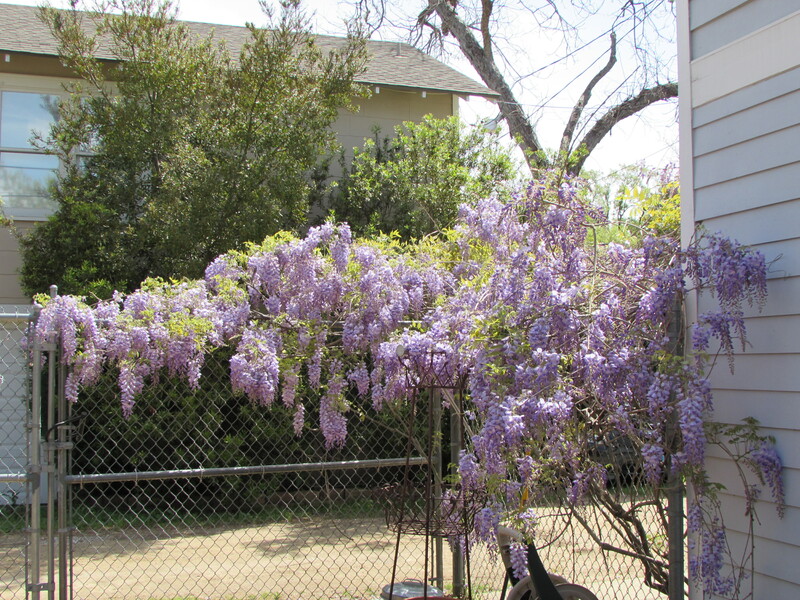 This is the wisteria that grows above the garage taking advantage of our chain link fence. The shades of the flowers are bluish purple to pale pink and even white depending on the variety and have a lovely fragrance. As the wisteria ages it develops a nice woody trunk. I have seen it standing on its own like a small tree before. Some of the plants take a long time to mature and may not flower the first 10 plus years. They do need full sun and well-drained soil. 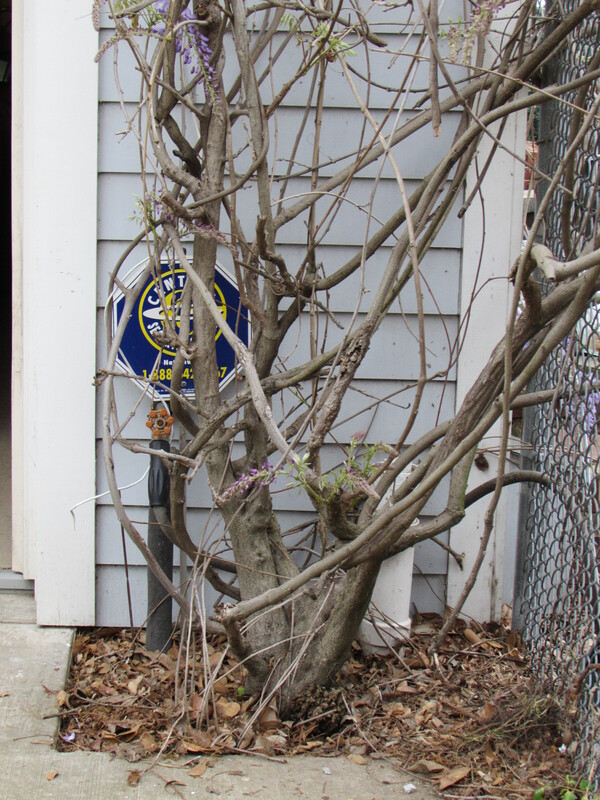 Some annual pruning is required to keep it in its place and maintain the health of the plant. Pruning also helps reduce the vigor of the vine and promote flowering. Bee sipping nectar and gathering pollen. 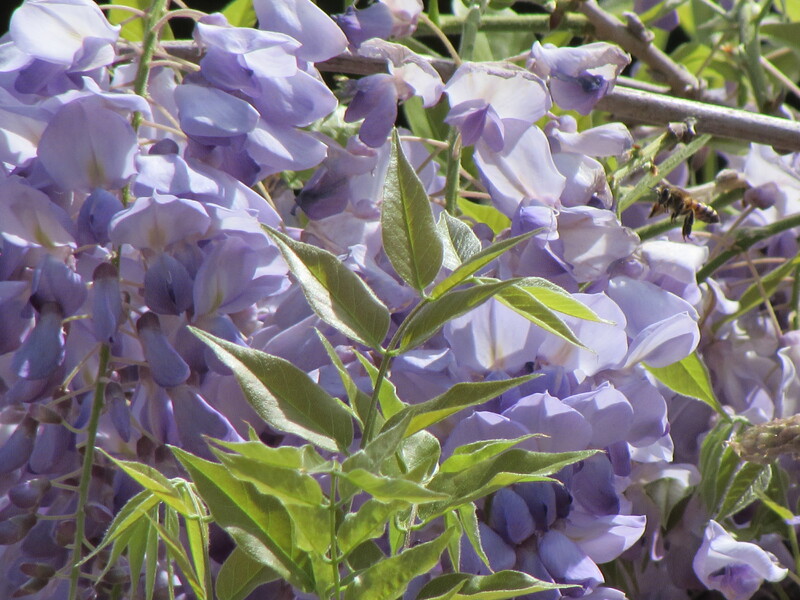 There is a form of wisteria called Evergreen Wisteria. 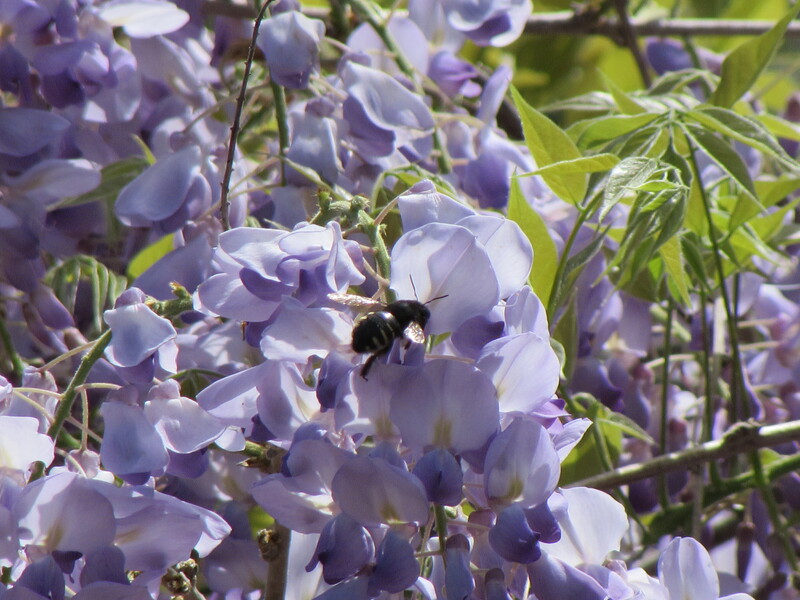 But it is not a true wisteria sinensis but a Millettia reticulate. It also belongs to the legume family, they do not share a genus. In milder climates like here in Houston it can be evergreen thus the name if we have a mild winter. It is more delicate and more controlled in its growth habit and less likely to take over so can be a better choice for certain situations. However the blooms which come in summer are smaller, less showy flowers.